Back in 1996 the Coca-Cola company delivered unto the extreme masses a slice of citrus-flavored Norwegian heaven, only to rip the cans cruelly from our lips six years later. Today the company announces the return of Surge. It's ReSurgence Day. Essentially a port of Norway's Urge, a soft drink that remains popular to this day, Surge's purpose in the marketplace was to beat the living hell out of Pepsi's Mountain Dew, threatening its hold on the extreme people of America. For awhile it looked like the tart and tangy bright green beverage might actually get the job done. Alas, the Dew proved too powerful, and in 2002 slumping sales forced Coke to can Surge. Or uncan it. Something. They stopped selling the damn drink. Fans were despondent. I can attest to this, as I was a fan and was despondent. 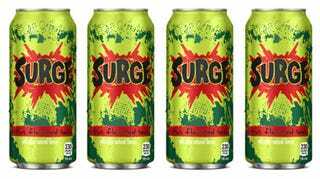 I was more shaken by the death of Surge than I was when Pepsi discontinued Cherry Cola Slice back in 1988 to make way for Wild Cherry Pepsi. I was not alone in my despondency. Fans complained when Surge went away, and kept on complaining. The most vocal group, the more than 130,000 strong Surge Movement, played a pivotal role in getting Coca-Cola to finally bring back the soft drink, going as far as gathering cash to purchase a billboard calling for its return down the street from the company's Atlanta headquarters. And so today our long struggle is over, but don't run to the store just yet. In a first-of-its-kind deal, Coca-Cola will be distributing 12 packs of 16-ounce cans exclusively through Amazon.com. The 12 packs aren't available for purchase just yet, but Amazon customers can sign up to be notified when they go on sale. You can be damn sure I signed up. If this Surge resurgence is successful, perhaps other companies will follow suit, producing small batches of long-lost snacks and drinks for sale online. Perhaps one day, in the not too distant future, I'll wake up to a delicious bowl of OJ's cereal, munch on a Zebar for lunch, and then settle in for some sort of forgotten crap food I shouldn't eat for dinner. We'll say Leady McLeaderson's Lead Flakes. Welcome back, Surge. You have been missed. Update: According to comments, Amazon has posted Surge for sale twice now, only to have it quickly sell out. Holding out for a third batch!